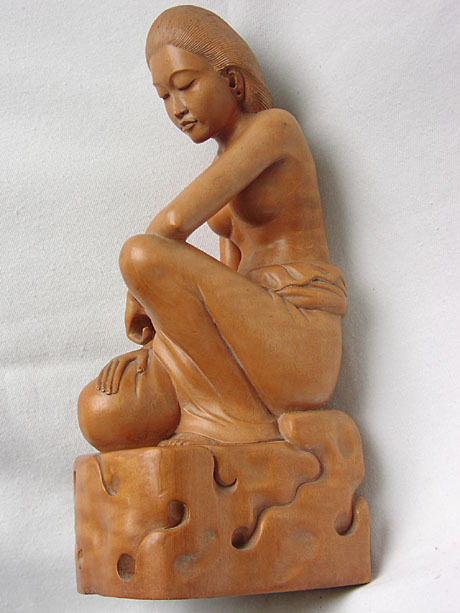 Kneeling balinese woman made by I RODJA. Nice carving of the famous Balinese artist I RODJA, who turned out to become one of Bali most important woodcarvers together with I GEREMBOEANG and IDA BAGUS NYANA. His output was limited because of his political activities in the fifties and sixties, what eventually caused his dramatic death in 1965. His work is displayed in the Tropenmuseum in Amsterdam and the Puri Likisanmuseum in Ubud Bali. No damages or restaurations. Satin wood.